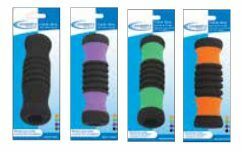 I PURCHASED WALKING CANE HANDLE CHUSHIONS, 4 IN VARIOUS COLORS. THEY WORK JUST GREAT. FIT MY CANE PERFECTLY. VERY SOFT, STURDY AND CHUSHIONY ON THE HAND. JUST WHAT I NEEDED. This product is exactly what I needed to replace an old worn out grip from a cane I purchased from Goodwill. Fabulous. Color (purple) is vibrant and stands out beautifully. Love it.